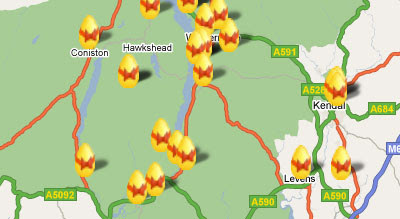 Golakes, the official website of Cumbria Tourism in the UK, has come up with an awesome Google Maps based egg hunt that should encourage a lot of visitors to the area this Easter. From 8th April until all the eggs are found, you can join the search for Peter Rabbit eggs across Cumbria and win wonderful prizes. Most Easter egg hunts take place in just one location but this one will cover an area of more than 2,600 square miles. Each of the 100 eggs in The Great Peter Rabbit Easter Egg Hunt has been specially designed by a local potter, Sue Dunne, and is a limited edition collector's item. Each person that finds an egg is also entitled to a free visit for up to 2 Adults and 2 Children to the World of Beatrix Potter Attraction, in Bowness-on-Windermere and a free copy of Peter Rabbit Easter Egg Hunt a brand new book published by F Warne & Co. The rough location of the hidden eggs are shown on the map. If you click on a map marker a clue to the egg's exact location is revealed. As each egg is found it is removed from the map and an update is published on Twitter.